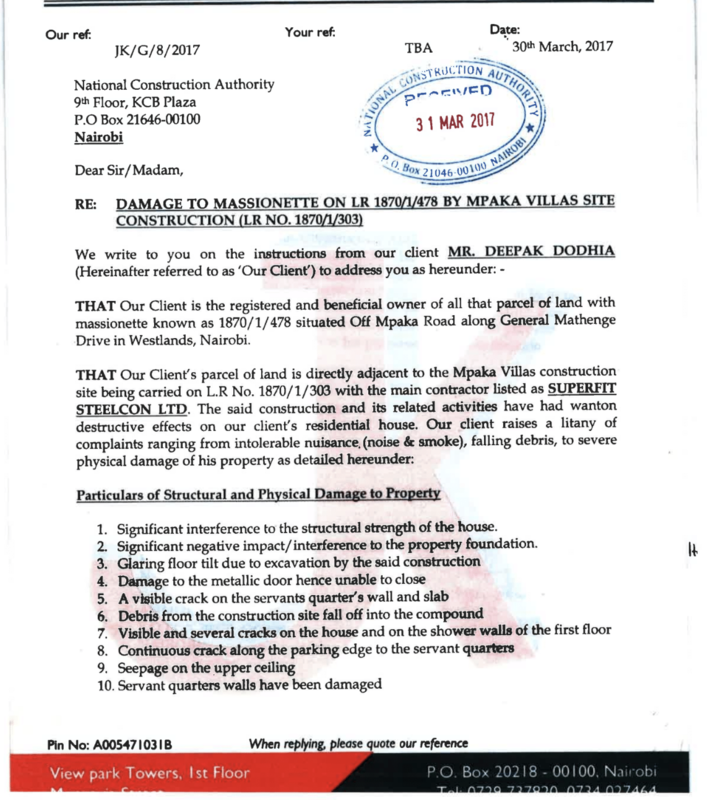 He has asked the DPP to investigate how the approvals and consents were given even after the NCA visited the construction site and confirmed that the building had structural defects and that the debris from the construction was falling on the Mr.Deepak’s property. The developer also went and constructed a 13 storey building while the approval only allowed 10 storeys. Mr. Deepak claims that the NCA failed in their mandate as they did not confirm to the public that the building was safe after having condemned the construction in May. The NCA approval was issued in August. Mr Deepak had sought to have the immediate cessation of the construction work of the apartment blocks until the contractor acknowledged the damages by entering into a binding undertaking to fully compensate or repair his property. Deepak had complained that the construction had caused damages to his home which is that is adjacent to the construction site. He had complained that the construction had led to interference with the strength of his house, its foundation, damage to the metallic door which is currently unable to close, seepage from the ceiling and damage to the walls of the servants quarter among other damages. He also complained after a generator was installed in front of his residence therefore causing noise pollution. 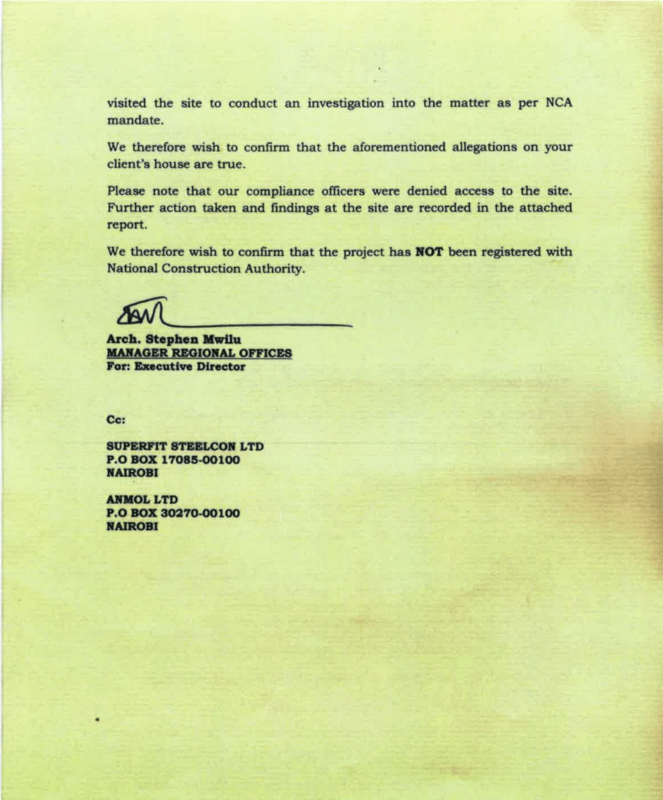 The contractor listed as Superfit Steelcon Limited on behalf of ANMOL Limited was contacted by the complainant and visited the complainant’s residence to assess the damages caused by the construction of the villas. The contractor acknowledged the damages and orally promised to correct and repair the damages caused. The contractor has however refused to give a written undertaking acknowledging the damages caused as a result of his work and his promise to correct and repair the damages caused. The NCA officers visited the construction site and established that the construction was unregistered. They also confirmed that the claims laid by Deepak were true. The officers were denied access to the building which was still under construction with the contractor in site. A closure notice was issued. The complainant had also lodged a complaint with the Nairobi county director of planning compliance and enforcement complaining about the structural cracks and damages to his property. Complains to NCA, NEMA and Nairobi City County have been ignored with even private chats to the governor not being acted on.